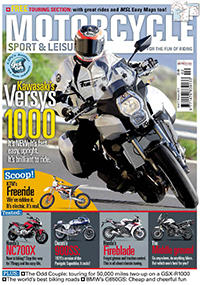 The February 2012 edition of the Motorcycle Sport & Leisure motorcycle magazine has an article regarding the regulation proposal (ant-tampering laws) that is heading through the European Parliament decision process. 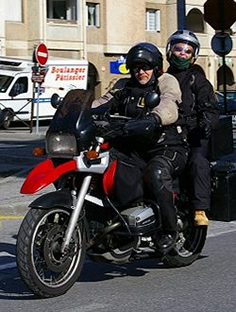 Steve gives his reasoning as, “Mostly because the first paragraph in it acknowledges that motorcycles are a solution to Europe’s congestion problems. But it goes on to say that many people who would otherwise want to ride one are put off by the perceived danger, backed up by the well-voiced statistic that we make up 2% of traffic but account for 16% of deaths. What is Right To Ride’s opinion of Steve Rose’s article? The article is certainly a different view from what we’ve been used to reading in the motorcycle press and on various forums and websites. We certainly think that is one of the more rational articles we’ve read so far. At Right To Ride we have repeatedly pushed to have an open debate about this proposal, to get an understanding of what it all means for motorcyclists. We have been in regular contact with various people in Brussels both within the Commission and parliament. A lot of our time has unfortunately been spent trying to rectify statements and comments that are totally irrelevant to the issues. What Steve Rose has done is to offer an intelligent well written article from his perspective. What Steve has also done is to point out that the vast majority of motorcyclists will still be able to accessorise and modify their motorcycles, even if that might be from the M&P catalogue or similar. As motorcycles become more technically advanced, whether that is good thing or not, it is what the manufacturers are offering to riders and what riders are buying. From ABS that will stop rear wheel lift and can be dialled in race, touring, wet weather mode and traction control to varying the power output for the conditions. 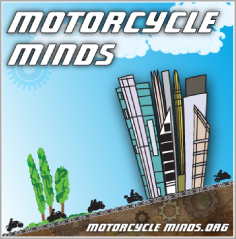 We reckon that the vast majority of motorcyclists do not care about anti-tampering (illegal modification) nor the mandatory fitting of some of these systems. It’s all beneficial, not only in having the latest gadgets, but being a better rider on a more technologically advanced and cleaner machine. Is this heresy or is it moving the debate onto a higher level? CO2 in motorcycles are in fact generally lower than cars anyway. With the new regulations the industry will be obliged to publish emissions (at the moment they don’t have to) thus giving motorcyclists the opportunity to be able to choose which bike they want and allow governments to determine road tax, which should mean paying less tax. Just on the Euro X environmental emissions topic, could you test a logic train of thought for me. So the concern is that motorcycle engines emit higher pollutants per unit fuel than their equivalent 4 (6, 8 etc) wheeled counterparts so they need to be made more environmentally friendly. But if motorcycles are already more fuel efficient on average than the general vehicle in traffic, aren’t they emitting less pollutants in total on a per kilometre basis? Wouldn’t this be an argument for being allowed to meet a lower Euro X standard and therefore save on weight and complexity of motorcycle engines/exhaust trains? Thanks for your comment Ian, always appreciated. As mentioned in the article, what we are aiming to do is to have an intelligent, articulated debate about this proposal. We do not agree with parts of the proposal, others we don’t have a problem with. Whatever your opinion or Steve Rose’s opinion, they are both very welcomed. What we’ve noted is that there is a considerable amount of hysteria about this proposal. But just as an example, why would anybody have an issue with motorcycles meeting Euro 4 or 5 emission levels? Having cleaner machinesseems to be a rational thing to do. There are many who whinge about high road tax, so surely this would enable consumers in the future to buy motorcycles that emit less pollution and therefore pay less tax. Knowing what emission levels my bike has, seems from my perspective, to offer me a choice. We certainly don’t have a problem with opening up repair and maintenance information for independent mechanics and repair shops. The fact that the proposal will now exclude EU countries from restricting motorcycles to 74Kw bhp, must surely be a positive thing. We certainly do not believe that compulsory ABS brakes will substantially reduce accidents for the reasons we set out in our paper “The Great European Poker Run”. Further to this, as we pointed out, it may well be the case that the technology will outdate the regulations. The Commission representative has argued that their reasoning (apart from the “safety” aspect) is because the industry is not playing cricket with the price of ABS brakes and has been artificially hiking up the price. In fact we would tend to agree with him. If you look at the article “India – First Motorcycle with ABS” in which they have produced an Apache RTR 180 with ABS (Bosch) which is also equipped with an RLP (Rear Wheel Lift-off Protection) system. It costs around £1000 in India…. We do not believe that compulsory AHO will reduce accidents, although AHO is already in practice because the industry has done this as a voluntary measure since 2003 and from what we’ve seen, it really doesn’t make any difference. Our view is that this measure was in part to exclude machines from the far east. Although it seems to be short-sighted because the Chinese, Taiwanese and Indians etc will just remove the switch. From the Commission’s perspective, they tell us that they have no intentions of interfering with modifications,their reasoning is that it would be impossible to monitor and control (this would come under Article 52). In fact in the conversation with the Commission, they thought that “positive” modifications such as those used by NABD for disabled riders were brilliant and were wholly supportive (I took a load of documents that Rick Hulse had given me to show them). Steve Rose has more or less explained what the Commission aims to include or exclude as anti-tampering measures. The fat lady still has to sing and by providing solid arguments, this would actually be welcomed both by the Commission but also by MEPs who are trying very hard to get a handle of what it is that riders want. Hopefully this will exclude all the crap about Hi Viz and banning bikes over 7 years in France…. 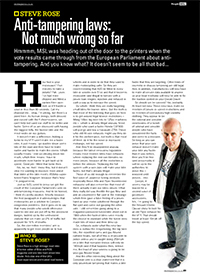 What is required are more contributions that (if that’s what people believe) would counter-balance Steve Rose’s article, but more importantly set out contributions that could be used in discussions with MEPs and the Commission. PS – the We is not the royal We – it means Trev and moi. It boils down to choice not compulsion. Whether you agree with the proposals or not, let us choose what we wish to do? Once “sensible” (?) compulsion has been accepted (“It’s all beneficial, not only in having the latest gadgets, but being a better rider on a more technologically advanced and cleaner machine”) then changing the now-existing legislation to be draconian/nonsensical will be a done deal. Thin end of the wedge anyone? Open wide!